Friday Harbor House is a charming seaside retreat in the San Juan Islands. Situated atop a bluff overlooking the scenic harbor, the lovely inn is easily accessible via a ferry ride around the islands or an exciting float plane trip from Bellingham, Seattle, or Vancouver. Friday Harbor House is ideally situated for exploring the little island and is within walking distance of several San Juan island activities, including walking and hiking, mountain biking, whale-watching, and antique shopping. 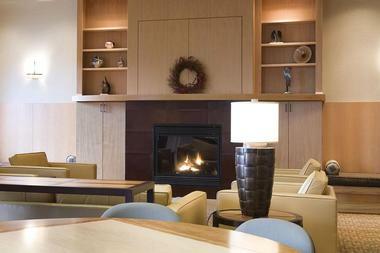 Friday Harbor House offers elegantly-appointed guest rooms and suites with private bathrooms, oversized jetted tubs, and spacious sitting areas with cozy fireplaces. The hotel is home to an on-site restaurant that serves traditional Friday Harbor fare, including fresh seafood and other produce sourced from local farms, as well as over 1,000 feet of function space for meetings, weddings, and retreats. 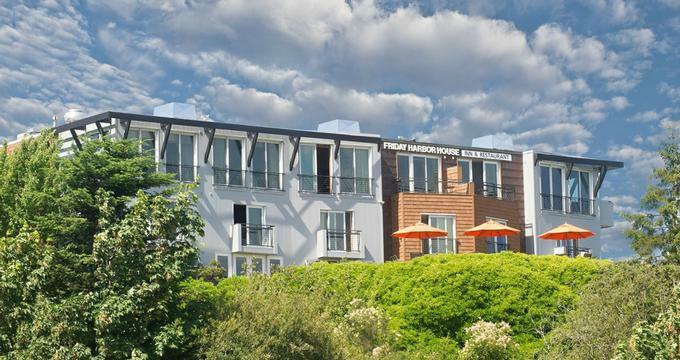 Friday Harbor House features 23 beautifully appointed guestrooms with contemporary décor and comfortable furnishings, inviting bedrooms and en-suite bathrooms with oversized jetted tubs for two, comfy sitting areas with gas fireplaces, flat-screen televisions, coffee makers, and fridges. All rooms have complimentary wireless Internet and boast lovely views of the marina, ferry landing, San Juan Channel, and Mount Constitution on Orcas Island. 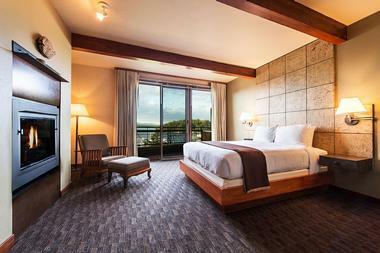 A complimentary continental breakfast is served to guests every morning and features a daily hot entrée, along with an array of other healthy choices such as organic hard boiled eggs, homemade granola, freshly baked pastries and treats with seasonal jams, fresh bagels, fresh fruit and juices, and local San Juan Roasters coffee. 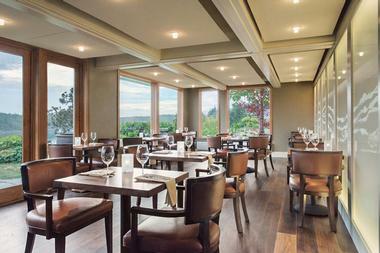 The Restaurant at Friday Harbor House offers both locals and guests a delightful San Juan Island dining experience. The popular dining establishment serves an innovative menu of locally sourced, seasonal cuisine along with an island-inspired menu of handcrafted cocktails, craft beers and fine wines against a backdrop of panoramic views. Upscale amenities at Friday Harbor House include an on-site restaurant serving seasonal cuisine, over 1,000 square feet of fully-equipped and flexible meeting and event space, daily housekeeping services, complimentary wireless Internet, and an array of local activities, such as hiking, biking, kayaking, whale watching, and golf. 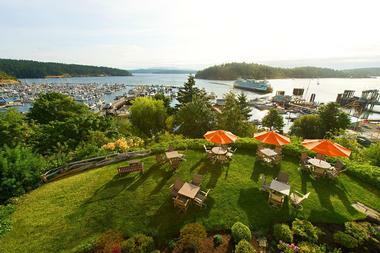 Friday Harbor House offers an exquisite venue for a quintessential San Juan Island wedding or elopement. The hotel not only offers breathtaking views of the marina and ocean, but also provides a range of services such as outstanding cuisine, china and stemware, and professional staff. Venues include the scenic bluff above the marina, which caters for up to 40 guests, and the elegant San Juan Room for receptions and dinners. Friday Harbor House also offers a cozy getaway for business travelers, groups or clubs, with over 1,000 feet of modern meeting space equipped with the latest in audiovisual equipment. The San Juan Room can accommodate up to 100 guests and provides a professional and peaceful setting for all types of function and event. Features of this stylish room include comfortable tables and chairs, a plasma screen display, the latest in audiovisual technology, complimentary wireless Internet, and a small outdoor garden for breaks. The lovely island of San Juan offers something for everyone from endless outdoor activities to annual events and festivals. Exuding sunshine for more than 245 days of the year, Friday Harbor is a haven for outdoor recreation and activities and has an abundance to choose from, including hiking, mountain biking, kayaking, fishing, scuba diving, boating or golf. Orca whale watching is a popular pastime, as is watching for other marine creatures such as seals, porpoises, and otters. There are two national parks on the island to enjoy, including British Camp (sometimes called English Camp) and American Camp, which delves into the history of a war that nearly occurred between the US and Britain in 1859. For those who prefer something slightly more relaxed, Friday Harbor is famed for its eclectic collection of art galleries, antique shops, boutiques, and bookstores. It is also reputed to have some of the best restaurants in the region, with an array of outstanding locally sourced and seasonal cuisine to enjoy. Visit the Roche Harbor Village, which is home to an 18-acre sculpture garden of original artworks and interesting artist booths, or taste wine and enjoy a cellar tour at the San Juan Vineyards.